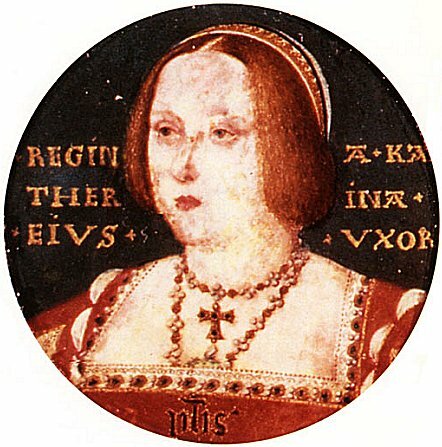 This is the earliest known portrait of Catherine. It was painted around 1502 so Catherine would have been about 17 at the time. It was probably painted shortly after her marriage to Arthur. She's wearing a traditional English gown of what appears to be dark velvet and a french hood (to be later popularized by Anne Boleyn). This portrait is now on display in Kunsthistorisches Museum, Vienna. There is no date for this portrait but judging from the way Catherine is protrayed, my guess is that it was done shortly before the Horenbout portrait. 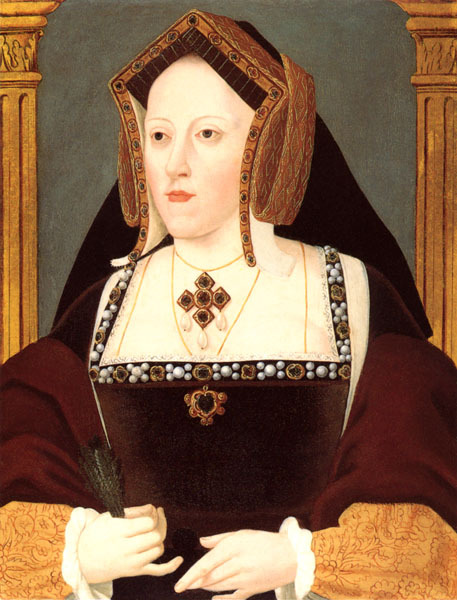 By her later years, Catherine had gained a significant amount of weight, as is evident in the next few portraits. This portrait was done while Catherine was around 40 years old. I'm not sure about the symbolism of the monkey. This painting was done when Catherine was near her mid 40s. Henry may have very well been initiating divorse proceedings at the time it was commissioned. Like the Horenbout portrait, she is wearing dark clothing and a English gable hood. This painting, with its color and detail, is a good example of Renaissance portraiture. 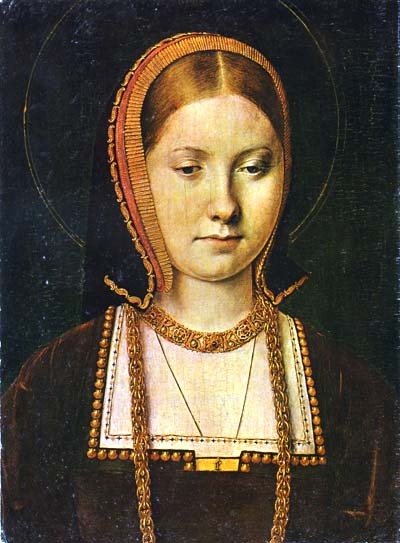 This is the most recognized portrait of Catherine. This photograph is part of a series of "portrait" photographs commissioned by the Deutsche Guggenheim Berlin. Mr. Sugimoto used four of the six wax figures of Henry's wives at Madame Tussaud's in London putting them against black backdrops and positioning them perfectly. 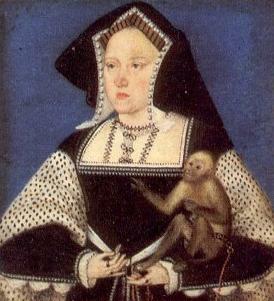 Catherine is shown with her familiar english gable hood and prayer book. 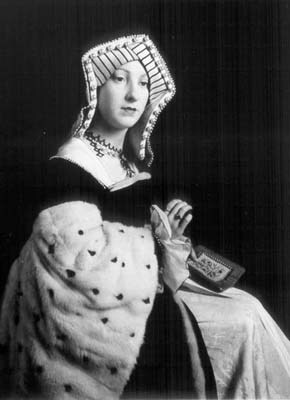 Sugimoto's book "Portraits" can be purchased at Amazon and (to the best of my knowledge) contains portraits of the wax figures of Anne Boleyn, Anne of Cleves, and Catherine Howard as well. 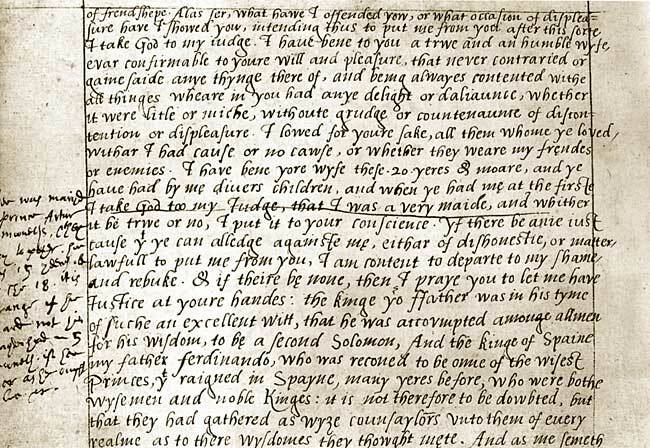 This is a letter in Catherine's own handwriting. She wrote it to Henry shortly after she discovered his plans for divorse. 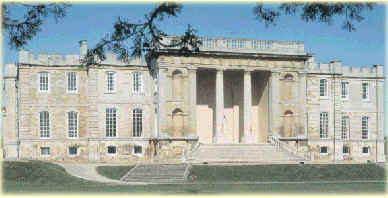 Kimbolton Castle is where Catherine spent tha last days of her life. She died there on January 7th, 1536. Kimbolton is now an independent co-educational school from 4 - 18 years. 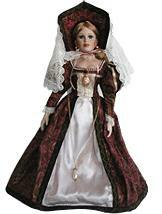 Porcelain collector doll of Catherine.